City based singer Riccha Paul runs P.O Box Nine, her home-based bakery, where she whips up all American desserts. P.O. Box Nine is an online bakery that serves up some sweet American goodness. Run by songstress Riccha Paul, whose adorable husky, Sebastian, is the brand’s mascot, this bakery is in the business of bringing authentic American desserts to our tables. Richa has been in the baking game since 2011, with her old patisserie Sugar Rush. She decided to revamp Sugar Rush and streamlined the menu to include several American specials, and thus P.O. Box Nine was born. The wholesome sweet American classics you can find here include Texas chocolate cheesecake, cinnamon rolls and good old double chocolate brownies. 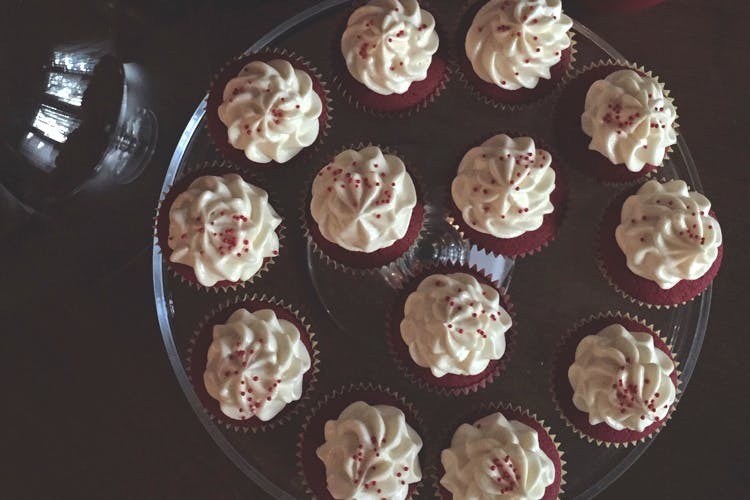 Richa claims that she has been baking red velvet cupcakes way before other people got in on the delicious trend. P.O. Box Nine has been a regular at LBB’s Dessert Bazaar, and we have to say we love the bakery’s Buttermilk Biscuits, which come slathered with a sweet, sticky Bourbon Sauce. You can order online through P.O. Box’s Facebook page here or their Instagram here. Prices start at INR 100 a piece but since these are online orders, you’ll have to place a minimum order of more than just one.